Use this vanity to bring more traditional style into your bathroom. Its white ceramic counter and white particle board base are very easy on the eyes. Keep your bathroom clean with the vanity's roomy double-door cabinet. Put a classic feel in your bathroom with this good-looking set from Magick Woods. Designed with a traditional style and strong build, this vanity is a perfect choice for any bathroom. The off-white marble counter and off-white plywood base make a beautiful look in your bathroom. Room is no problem with this vanity because it comes with a single-door cabinet and drawers. Put a nice touch on your bathroom's look with this vanity set from Bellaterra. For a bit of modern style in your bathroom, choose this beautiful vanity. With a white artificial stone counter and espresso particle board base, this piece is very stylish. The simple single-door cabinet is great to keep bathroom items in. Bring a classic look and feel to your bathroom with this beautiful set from Magick Woods. For some added modern style in your bathroom, choose this beautiful vanity. Its comes with a nice white artificial stone counter and grey particle board base for strength and style. With a single-door cabinet, this vanity can hold all your bathroom must-haves. Bring a classic look and feel to your bathroom with this beautiful set from Magick Woods. The Eurostone ensemble by Magick Woods is ideal for smaller bath and powder rooms with plenty of interior storage. Easy to install, the ensemble includes the vanity base, porcelain vanity top and chrome hardware. Keystone 30.25-inch W 2-Door Freestanding Vanity in White With Ceramic Top in White Use this vanity to bring more traditional style into your bathroom. Its white ceramic counter and white particle board base are very easy on the eyes. Keep your bathroom clean with the vanity's roomy double-door cabinet. Put a classic feel in your bathroom with this good-looking set from Magick Woods. 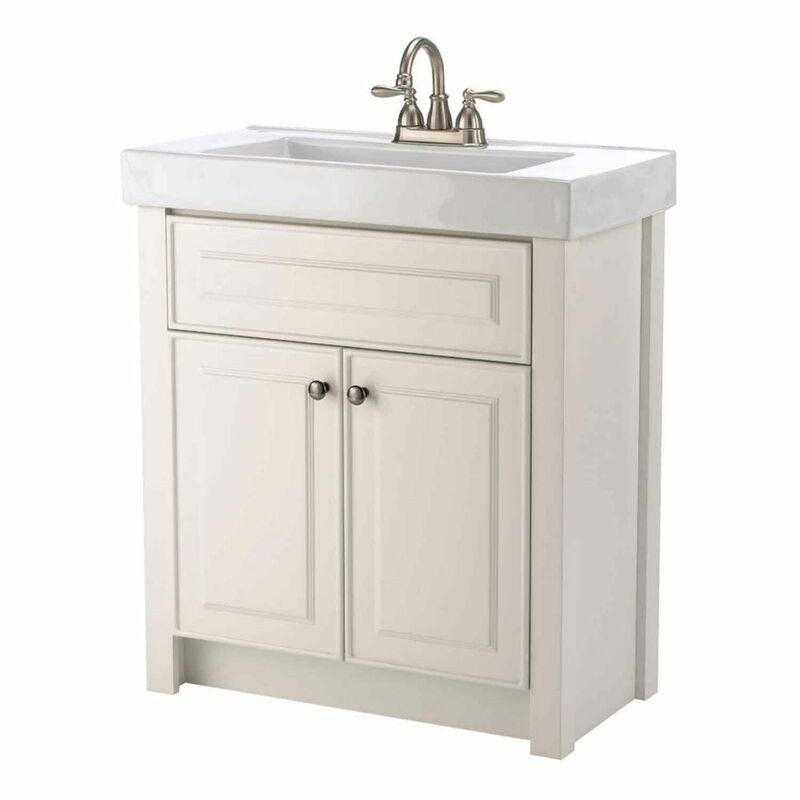 Keystone 30.25-inch W 2-Door Freestanding Vanity in White With Ceramic Top in White is rated 4.5 out of 5 by 2. Rated 4 out of 5 by Chimera from Perfect for narrow bathroom Purchased for narrow bathroom in 1960s bungalo. Only loses a star because I would have preferred drawers to cabinet doors. Rated 5 out of 5 by Kari from Perfect Vanity This vanity was perfect for our smaller ensuite bathroom. The design is interesting and efficient. I love the ceramic top.